M. Travis Lane was born on 23 September 1934 in San Antonio, Texas but has lived in Fredericton, New Brunswick since 1960. With her husband, Lauriat Lane Jr. (a professor emeritus in the Department of English at UNB prior to his death in 2005), she raised two children, Hannah and Lauriat III; they all became Canadian citizens in 1973. Lane earned an honours BA, Phi Beta Kappa, at Vassar College (1956), and an MA and PhD (1967) at Cornell University. While at Cornell, she marked for Vladimir Nabokov, acted as section leader for M.H. Abrams, and served on the editorial board of the Vassar Review. In Fredericton, she taught at the University of New Brunswick, where she has been an Honorary Research Associate since 1967. She has published numerous, deeply nuanced reviews and essays on Canadian, West Indian, and European poets in The Fiddlehead. Lane has been the recipient of many major literary awards: Mary Harding Baylor Prize (1952); Northern Light Editor's Prize (1975, 1980); The Pat Lowther Memorial Award (1980); Arc Poetry Prize (1982); Fiddlehead Poetry Prize (1991); Writers' Federation of New Brunswick Poetry Prize (1994); Amethyst Review Prize (1997); Atlantic Poetry Prize (2001); Alden Nowlan Award for Excellence in English Literature (2003); and Banff Centre Bliss Carman Poetry Award (2006). A frequent guest author at the Blue Bridge Music Festival in the York region of Ontario, her poem “The Apollonian Whale” was set to music by Humphrey Searle in 1980. Her poems “This Far” and “Owl” were also set to music by Brenda Muller, founder and director of the classical trio Ardeleana. With the group, Muller later composed and performed music for Lane's long poem “The Witch of the Inner Wood." Lane has an entry in The Dictionary of Literary Biography: Canadian Writers Since 1960 (W.H. New), and her work is included in over two dozen anthologies. 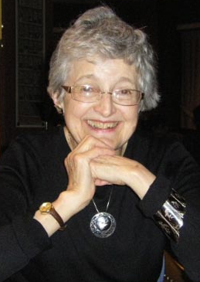 She is a lifetime member of the League of Canadian Poets, a founder of the Writers’ Federation of New Brunswick, and a member of both the Raging Grannies and Voice of Women for Peace. Biographical notes written by Kathleen McConnell, via the New Brunswick Literary Encyclopedia. The city is paved with invisible blood. Rains have washed the sidewalks clean. and numbed the pierced cathedrals. has hung its funereal wedding cake. The party is over. The guests have gone. Or perhaps it was somewhere else you fell. Under the children’s graveled swings? Or there, where the students rack their bikes? they tied over your eyes to blind themselves. crumbles like silt on a snowy page. The hills move into the darknesses. grave pits below them, wither, fade. of roots, of clay, of dripping stone. Published in Touch Earth (Guernica Editions). Poem: "What Can Be Named in Numbers Reasures"
What can be named in numbers reassures. which measures nothing, spells itself. But are we needed after all? drowns the red sky, is beautiful. Published in Keeping Afloat (Guernica Editions). Critical Analysis: M. Travis Lane's Compassionate Aesthetics in "What Can Be Names in Numbers Reassures" and "Elegy"
Though M. Travis Lane draws inspiration from “nature, science, the news, art, music, something someone has said, [and] most of all, other poetry” (Lane CanLit), aesthetic considerations drive her poetry. Lane notes that “most of what I’m doing is feeling out a cadence, a sound, a feeling” (qtd. in Lynes Words 96), further qualifying that “when I write a poem, I think a lot about how it sounds, and I revise a great deal in order to get the sound right for the subject” (Lane CanLit). admiring the beauty of an insect’s flight. I wanted to write a poem that would reflect or imitate that beauty….The sound that started me on the poem was a conventionally metred five beat line: “What can be named in numbers reassures.”… But that would not be the right sound for the insect stanza. So I tried for a long swooping sailing sound, and broke up the line to imitate the leaps and zigzags of the bug. Then I do a zigzag of my own. Instead of going on to say how beautiful all this is, I change the direction of the poem and ask, does this beauty require us in order for it to be beautiful? (CanLit). That change of direction—from formal concern to philosophical question—characterizes Lane’s poetry, despite her belief that “messages are for prose. Poetry is more like dancing” (CanLit). Indeed, poems like “What Can Be Named in Numbers Reassures” dance Lane’s readers along in a dizzying manner, haphazard as an insect’s flight, subject to wind and pheromones and imperceptible concerns; yet, it is the very imperceptibility of those concerns that points to the trope of belief and faith that runs throughout Lane’s poetic oeuvre. “What Can Be Named in Numbers Reassures” ultimately asks “are we needed after all?” (17) and then answers “without a noun or numeral the lake / drowns the red sky, is beautiful” (18-19). Thus, Lane comforts readers even as she recommends that they resist analyzing the insect’s meanderings and instead trust that there is meaning in it. As with an insect’s flight, so with Lane’s poems; rather than render them down to constituent premises, readers are invited to observe and to relish in the larger significance they gesture toward. Brian Bartlett observes that “in her nine books of poems [Lane] celebrates the miniature more often than the massive” (122). However, that focus leads to heftier preoccupations: “Elegy” begins with the image of that little place in a playground “where the bullet nicked / concrete” (9-10) but goes on to note that “[t]he city is paved with invisible blood” (11). Lane’s concerns—belief, conflict, peace, place, ecologies, language—resist separation into neat categories. She writes, in the introduction to Temporary Shelter, “I have arranged the poems in this book as I might flowers in a vase, not in an order, but with an eye to balance, grace and variation” (xi). Formal, aesthetic considerations inform her writing from inspiration to publication. Bartlett, Brian. “Back to the Basket of Small Things: Size in the Poems of M. Travis Lane.”The Antigonish Review 147 (2006): 121-36. Lane, M. Travis. CanLit Poets: M. Travis Lane. canlit.ca. Canadian Literature, 21 Apr. 2010. Web. 20 Aug. 2010. ---. “Elegy.” Touch Earth. Toronto: Guernica, 2006. 29-32. Print. ---. “Structuring Miscellany.” Temporary Shelter. Fredericton: Goose Lane, 1993. ix-xi. ---. "What Can Be Named in Numbers Reassures." CanLit Poets: M. Travis Lane. Canadian Literature, 25 June 2008. Web. 30 July 2011. Lynes, Jeanette, ed. “M. Travis Lane and the Art of Layers.” Words Out There: Women Poets in Atlantic Canada. Ed. Jeanette Lynes. Lockeport: Roseway 1999. 96-101. Lane, M. Travis . “Afterword: Those Mysteries of Which We Cannot Plainly Speak.” The Crisp Day Closing on My Hand: The Poetry of M. Travis Lane. Ed. Jeanette Lynes. Waterloo: Wilfrid Laurier UP, 2007. 77-80. ---. An Inch or so of Garden. Limited edition. Fredericton: University of New Brunswick, 1969. ---. "Back at Dover." The Fiddlehead 270 (Winter 2017): 61. Print. ---. The Book of Widows. Victoria: Frog Hollow, 2010. ---. CanLit Poets: M. Travis Lane. canlit.ca. Canadian Literature, 21 Apr. 2010. Web. 20 Aug. 2010. ---. “Christmas Goes Back to the Attic.” Antigonish Review 138 (2004): 103. Literature Online. Web, print. 26 Jul 2011. ---. “Codicil.” Compton et.al. Coastlines: the Poetry of Atlantic Canada. Fredericton, NB: Goose Lane, 2002. Print. 54. ---. “Contemporary Canadian Verse: The View From Here.” University of Toronto Quarterly52.2 (Winter 1982): 179-191. Academic Search Premier. Web, print. 26 Jul 2011. ---. The Crisp Day Closing on My Hand: The Poetry of M. Travis Lane. Ed. by Jeanette Lynes, Waterloo: WLU Press, 2007. ---. "The Crossing." Event 46.2 (Winter 2017): 11-13. Print. ---. Crossover. Toronto: Cormorant Books, 2015. Print. ---. "A Difficult Beauty." The Fiddlehead 271 (Spring 2017): 107-109. Print. ---. Divinations and Shorter Poems. Fredericton: Fiddlehead Poetry Books, 1980. ---. The Essential Travis Lane. Ed. by Shane Neilson, Erin: The Porcupine's Quill, 2016. Print. ---. “Elegy.” Words Out There. Ed. Jeanette Lynes. Lockeport, NS: Roseway, 1999. 18-20. ---. “For Brigid.” Compton et. al. Coastlines: the Poetry of Atlantic Canada. Fredericton, NB: Goose Lane, 2002. Print. 55. ---. "Form as Meaning." Rev. of Human Misunderstanding by Kathy Mac, The Fiddlehead 275 (Spring 2018): 108-110. Print. ---. "From This Valley They Say You Are Going." Event 46.2 (Winter 2017): 14. Print. ---. “The Ghost.” Antigonish Review 157 (2009): 88. Literature Online. Web, print. 26 Jul 2011. ---. “The Gravel Pit. Canadian Literature 170/171 (2001): 20. Academic Search Premier. Web, print. 26 Jul 2011. ---. Heart on Fist: Essays and Reviews 1970-2016. Ed. by Shane Neilson, Windsor: Palimpsest Press, 2016. ---. Homecomings. Fredericton: Goose Lane, 1977. ---. “Hummingbird.” Canadian Literature 182 (2004): 11. Literature Online. Web, Print. 26 Jul 2011. ---. "Imagine a Quilt of Water." The Fiddlehead 270 (Winter 2017): 63-64. Print. ---. Keeping Afloat. Toronto: Guernica, 2001. ---. "Late Fall." The Fiddlehead 270 (Winter 2017): 62. Print. ---. “Locating the Particle.” Canadian Literature 191 (2006): 147. Academic Search Premier. Web, print. 26 Jul 2011. ---. Night Physics. Kingston: Brick, 1994. ---. “Noise.” Antigonish Review 157 (2009): 86. Literature Online. Web, print. 26 Jul 2011. ---. “Palm.” Antigonish Review 157 (2009): 87. Literature Online. Web, print. 26 Jul 2011. ---. Poems 1968-1972. Fredericton: Fiddlehead Poetry Books, 1973. ---. “Poem Upon the Forcible Entry by Cat into a Poem Originally Upon Trilliums.” Compton et. al. Coastlines: the Poetry of Atlantic Canada. Fredericton, NB: Goose Lane, 2002. Print. 54. ---. “Portobello.” Compton et. al. Coastlines: the Poetry of Atlantic Canada. Fredericton, NB: Goose Lane, 2002. Print. 56. ---. Reckonings. Fredericton: Goose Lane, 1988. ---. Solid Things: Poems New and Selected. Toronto: Cormorant, 1989. ---. Temporary Shelter. Fredericton: Goose Lane, 1993. ---. "That World and This One." The Fiddlehead 274 (Winter 2018): 114. Print. ---. Touch Earth. Toronto: Guernica, 2006. ---. Truth or Beauty. Toronto: Anstruther Press, 2015. ---. “The View from Under the Bookcase.” Canadian Literature 169 (2001): 102. Academic Search Premier. Web, print. 26 Jul 2011. ---. The Witch of the Inner Wood: Collected Long Poems. Ed. Shane Neilson. Fredericton: Icehouse Poetry, 2016. Print. ---, and Shane Neilson. The Essential Travis Lane. Erin, ON: The Porcupine’s Quill, 2015. Internet resource. 1995/96 Anthology of Magazine Verse & Yearbook of American Poetry. Beverly Hills: Monitor Book Co., 1996. Bartlett, Brian. “Back to the Basket of Small Things: Size in the Poems of M. Travis Lane.”The Antigonish Review 147 (Autumn 2006): 121-36. Colman, Robert. "The Art of the Long Poem." Rev. of The Witch of the Inner Wood by M. Travis Lane. Prism International, prismmagazine.ca, 6 Apr. 2017. Web. 29 Nov. 2018. Compton, Anne, et al., eds. Coastlines: The Poetry of Atlantic Canada. Fredericton: Goose Lane, 2002. Crocker, Elaine, ed. Choice Atlantic: Writers of Newfoundland and the Maritimes. St. John’s: Breakwater, 1990. Elder, Jo-Anne and Colin O’Connell, eds. Voices and Echoes. Waterloo: Wilfrid Laurier UP, 1997. LeTourneau, Ian. "The Crisp Day Closing on My Hand: The Poetry of M. Travis Lane edited by Jeanette Lane." Rev. of The Crisp Day Closing on My Hand by M. Travis Lane. Poetry Reviews, poetryreviews.ca, 15 Sep. 2009. Web. 30 Nov. 2018. Lynes, Jeanette, ed. The Crisp Day Closing on My Hand: The Poetry of M. Travis Lane. Waterloo: Wilfrid Laurier UP, 2007. ---. “Introduction.” The Crisp Day Closing on My Hand: The Poetry of M. Travis Lane. Ed. Jeanette Lynes. Waterloo: Wilfrid Laurier UP, 2007. ix-xvi. ---. “M. Travis Lane and the Art of Layers.” Words Out There: Women Poets in Atlantic Canada. Ed. Jeanette Lynes. Lockeport, NS: Roseway 1999. 96-101. Meyer, Bruce. “The Fine Art of Adapting: The Poetry of M. Travis Lane.” Fiddlehead 236 (2008): 159-162. Literature Online. Web, print. 26 Jul 2011. McNeilly, Kevin. "The Witch of the Inner Wood: Collected Long Poems/Heart on Fist: Essays and Reviews 1970-2016/How Thought Feels: The Poetry of M. Travis Lane." Rev. of The Witch of the Inner Wood and Heart on Fist by M. Travis Lane and How Thought Feels by Shane Neilson, The Malahat Review 199 (Summer 2017): 95-101. Print. Mitcham, Allison, Stephanie Mitcham Sexton, and Theresa Quigley, eds.. Poetic Voices of the Maritimes. Hantsport: Lancelot, 1996. Neilson, Shane, ed. How Thought Feels: the poetry of M. Travis Lane. Victoria: Frog Hollow Press, 2015. New, W.H., ed. “M. Travis Lane.” The Dictionary of Literary Biography: Canadian Writers Since 1960. Web. Nicholas, Bradley. "Poems of the Leafy Mind." Rev. of The Waking Comes Late by Steven Heighton and The Witch of the Inner Wood by M. Travis Lane. Canadian Literature 233 (Summer 2017): 145-147. Print. Sinclair, Sue. "Shining a Light on M. Travis Lane." Rev. of How Thoughts Feel: the poetry of M. Travis Lane by Shane Neilson. Fiddlehead 274 (Winter 2018): 103-106. Print. Surkan, Neil. "Fist, Fire, and Heart." Rev. of Heart on Fist by M. Travis Lane and Strike Anywhere by Michael Lista, Canadian Literature 233 (Summer 2017): 155-156. Print. Source list partially provided by the New Brunswick Literary Encyclopedia.